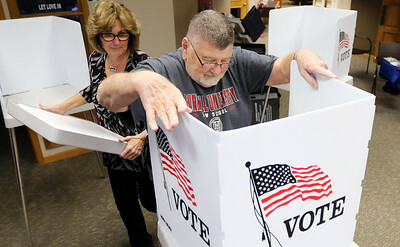 Matthew Apgar - mapgar@shawmedia.com Election judges Sharon Werdell (left) and Larry Rasp assemble voting booths at the polling location for Algonquin precincts 52, 53, 54, and 66 at Hope Church, 451 Ackman Road, on Monday, March 19, 2018 in Crystal Lake.at Hope Church, 451 Ackman Road, on Monday, March 19, 2018 in Crystal Lake. 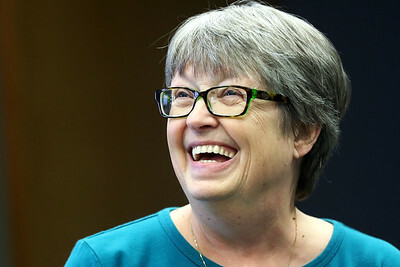 Matthew Apgar - mapgar@shawmedia.com Election judge and site manager Carol Majkrazak of Algonquin laughs with her peers as they set up the polling location for Algonquin precincts 52, 53, 54, and 66 at Hope Church, 451 Ackman Road, on Monday, March 19, 2018 in Crystal Lake. 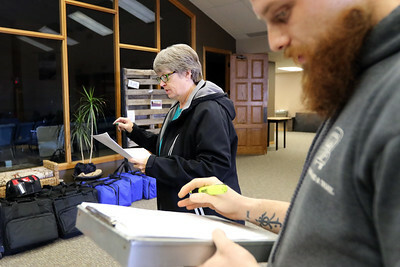 Matthew Apgar - mapgar@shawmedia.com Election judge and site manager Carol Majkrzak of Algonquin watches as Gavin O'Laughlin (left) and Ryan Mayfield of Two Men and a Truck deliver all the items need to set up the polling location for Algonquin precincts 52, 53, 54, and 66 at Hope Church, 451 Ackman Road, on Monday, March 19, 2018 in Crystal Lake.at Hope Church, 451 Ackman Road, on Monday, March 19, 2018 in Crystal Lake. Matthew Apgar - mapgar@shawmedia.com Election judge and site manager Carol Majkrzak of Algonquin (center) goes over the delivery inventory with Ryan Mayfield of Two Men and a Truck directly after all items were delivered at the polling location for Algonquin precincts 52, 53, 54, and 66 at Hope Church, 451 Ackman Road, on Monday, March 19, 2018 in Crystal Lake.at Hope Church, 451 Ackman Road, on Monday, March 19, 2018 in Crystal Lake. Matthew Apgar - mapgar@shawmedia.com Matt Harris of Two Men and a Truck unloads items used to set up the polling location for Algonquin precincts 52, 53, 54, and 66 at Hope Church, 451 Ackman Road, on Monday, March 19, 2018 in Crystal Lake.at Hope Church, 451 Ackman Road, on Monday, March 19, 2018 in Crystal Lake. 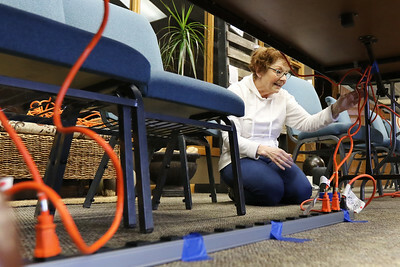 Matthew Apgar - mapgar@shawmedia.com Election judge Rose Anne Roth looks for an electrical socket as she and other election judges set up the polling location for Algonquin precincts 52, 53, 54, and 66 at Hope Church, 451 Ackman Road, on Monday, March 19, 2018 in Crystal Lake.at Hope Church, 451 Ackman Road, on Monday, March 19, 2018 in Crystal Lake. 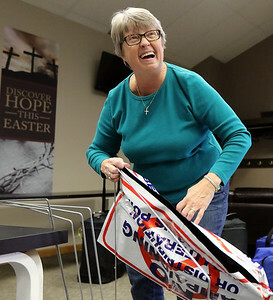 Matthew Apgar - mapgar@shawmedia.com Election judge and site manager Carol Majkrzak of Algonquin laughs with her peers as they set up the polling location for Algonquin precincts 52, 53, 54, and 66 at Hope Church, 451 Ackman Road, on Monday, March 19, 2018 in Crystal Lake.at Hope Church, 451 Ackman Road, on Monday, March 19, 2018 in Crystal Lake. 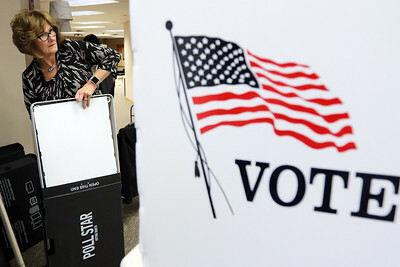 Matthew Apgar - mapgar@shawmedia.com Gavin O'Laughlin of Two Men and a Truck unloads items used to set up the polling location for Algonquin precincts 52, 53, 54, and 66 at Hope Church, 451 Ackman Road, on Monday, March 19, 2018 in Crystal Lake.at Hope Church, 451 Ackman Road, on Monday, March 19, 2018 in Crystal Lake. 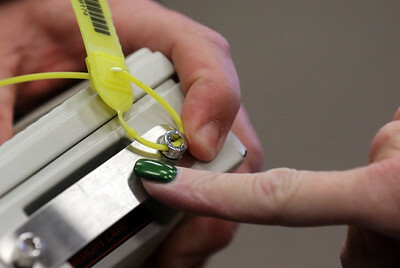 Matthew Apgar - mapgar@shawmedia.com Technical judge Joel Sawyer and site manager Carol Majkrzak, both election judges, check the seal on an optical scanner used to tabulate votes at their polling location for Algonquin precincts 52, 53, 54, and 66 at Hope Church, 451 Ackman Road, on Monday, March 19, 2018 in Crystal Lake.at Hope Church, 451 Ackman Road, on Monday, March 19, 2018 in Crystal Lake. 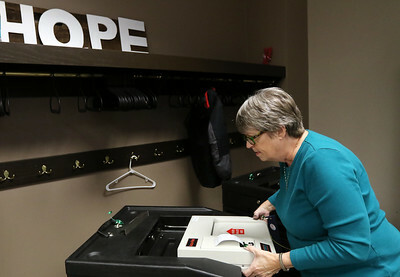 Matthew Apgar - mapgar@shawmedia.com Election judge and site manager Carol Majkrzak assembles an optical scanner used to tabulate votes at her polling location for Algonquin precincts 52, 53, 54, and 66 at Hope Church, 451 Ackman Road, on Monday, March 19, 2018 in Crystal Lake.at Hope Church, 451 Ackman Road, on Monday, March 19, 2018 in Crystal Lake. 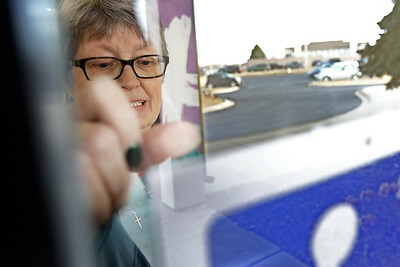 Matthew Apgar - mapgar@shawmedia.com Election judge and site manager Carol Majkrzak tapes a handicapped accessible sign to the door at her polling location for Algonquin precincts 52, 53, 54, and 66 at Hope Church, 451 Ackman Road, on Monday, March 19, 2018 in Crystal Lake.at Hope Church, 451 Ackman Road, on Monday, March 19, 2018 in Crystal Lake. 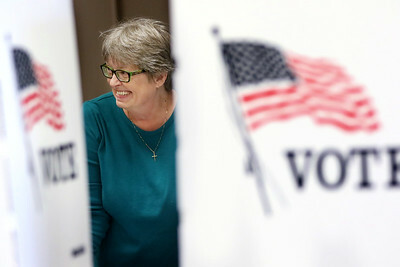 Matthew Apgar - mapgar@shawmedia.com Election judge Sharon Werdell assembles voting booths as she and her peers set up the polling location for Algonquin precincts 52, 53, 54, and 66 at Hope Church, 451 Ackman Road, on Monday, March 19, 2018 in Crystal Lake.at Hope Church, 451 Ackman Road, on Monday, March 19, 2018 in Crystal Lake. 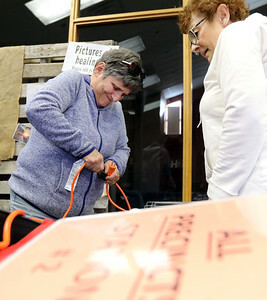 Matthew Apgar - mapgar@shawmedia.com Election judges Rose Ann Roth (left) and Joanne Johnson attempt to unwind 100 feet of twine used as a distance marker for outdoor signs at their polling location for Algonquin precincts 52, 53, 54, and 66 at Hope Church, 451 Ackman Road, on Monday, March 19, 2018 in Crystal Lake.at Hope Church, 451 Ackman Road, on Monday, March 19, 2018 in Crystal Lake. 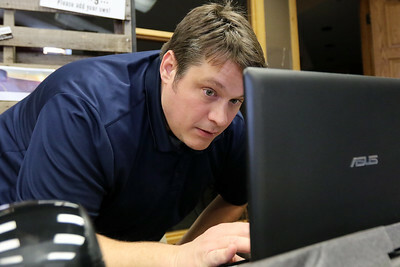 Matthew Apgar - mapgar@shawmedia.com Technical judge Joel Sawyer sets up the laptops at the polling location for Algonquin precincts 52, 53, 54, and 66 at Hope Church, 451 Ackman Road, on Monday, March 19, 2018 in Crystal Lake.at Hope Church, 451 Ackman Road, on Monday, March 19, 2018 in Crystal Lake. 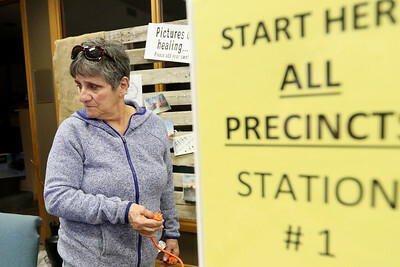 Matthew Apgar - mapgar@shawmedia.com Election judge and site manager Carol Majkrzak of Algonquin assembles an outdoor sign that warns of no campaigning at the polling location for Algonquin precincts 52, 53, 54, and 66 at Hope Church, 451 Ackman Road, on Monday, March 19, 2018 in Crystal Lake.at Hope Church, 451 Ackman Road, on Monday, March 19, 2018 in Crystal Lake. 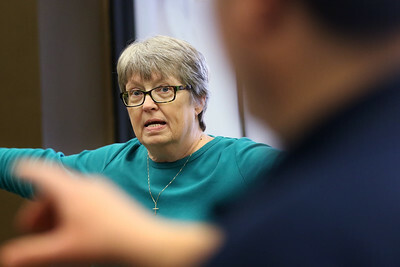 Matthew Apgar - mapgar@shawmedia.com Election judge Joanne Johnson works on giving power to the laptops at the polling location for Algonquin precincts 52, 53, 54, and 66 at Hope Church, 451 Ackman Road, on Monday, March 19, 2018 in Crystal Lake.at Hope Church, 451 Ackman Road, on Monday, March 19, 2018 in Crystal Lake. 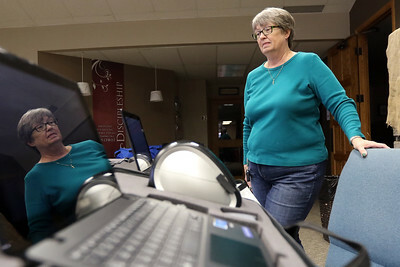 Matthew Apgar - mapgar@shawmedia.com Election judge and site manager Carol Majkrzak of Algonquin watches as she boots up a laptop at the polling location for Algonquin precincts 52, 53, 54, and 66 at Hope Church, 451 Ackman Road, on Monday, March 19, 2018 in Crystal Lake.at Hope Church, 451 Ackman Road, on Monday, March 19, 2018 in Crystal Lake. 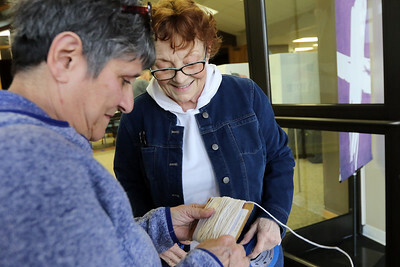 Matthew Apgar - mapgar@shawmedia.com Election judges Rose Ann Roth (left) and Joanne Johnson give power to the laptops at the polling location for Algonquin precincts 52, 53, 54, and 66 at Hope Church, 451 Ackman Road, on Monday, March 19, 2018 in Crystal Lake.at Hope Church, 451 Ackman Road, on Monday, March 19, 2018 in Crystal Lake. 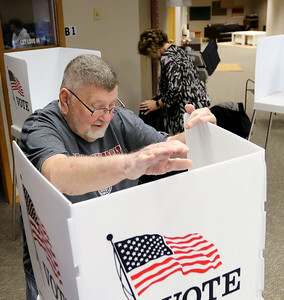 Matthew Apgar - mapgar@shawmedia.com Election judges Larry Rasp (front) and Sharon Werdell assemble voting booths at the polling location for Algonquin precincts 52, 53, 54, and 66 at Hope Church, 451 Ackman Road, on Monday, March 19, 2018 in Crystal Lake.at Hope Church, 451 Ackman Road, on Monday, March 19, 2018 in Crystal Lake. Matthew Apgar - mapgar@shawmedia.com Election judge and site manager Carol Majkrzak of Algonquin (left) goes over the site layout with technical judge Joel Sawyer as they set up the polling location for Algonquin precincts 52, 53, 54, and 66 at Hope Church, 451 Ackman Road, on Monday, March 19, 2018 in Crystal Lake.at Hope Church, 451 Ackman Road, on Monday, March 19, 2018 in Crystal Lake. 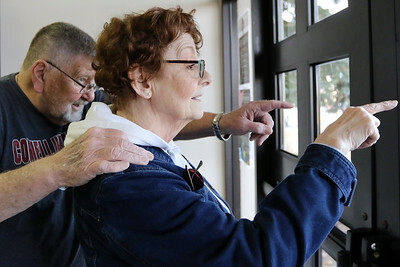 Matthew Apgar - mapgar@shawmedia.com Election judges Larry Rasp (left) and Joanne Johnson look out the window to determine an appropriate distance to post signs outside of the polling location for Algonquin precincts 52, 53, 54, and 66 at Hope Church, 451 Ackman Road, on Monday, March 19, 2018 in Crystal Lake.at Hope Church, 451 Ackman Road, on Monday, March 19, 2018 in Crystal Lake. 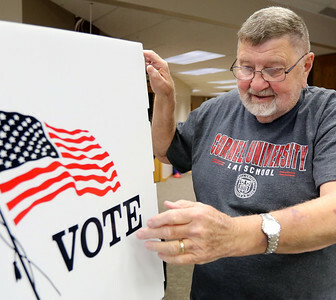 Matthew Apgar - mapgar@shawmedia.com Election judge Larry Rasp assembles a voting booth at the polling location for Algonquin precincts 52, 53, 54, and 66 at Hope Church, 451 Ackman Road, on Monday, March 19, 2018 in Crystal Lake.at Hope Church, 451 Ackman Road, on Monday, March 19, 2018 in Crystal Lake. 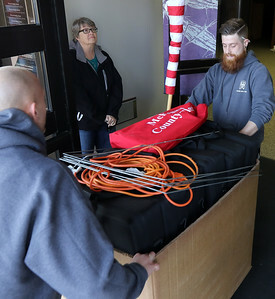 Gavin O'Laughlin of Two Men and a Truck unloads items used to set up the polling location for Algonquin precincts 52, 53, 54, and 66 at Hope Church, 451 Ackman Road, on Monday, March 19, 2018 in Crystal Lake.at Hope Church, 451 Ackman Road, on Monday, March 19, 2018 in Crystal Lake.